There is no elevation too high or product too sticky for this custom conveyor elevator design.The system was designed to move product up 12 feet to a fill machine. This turnkey system begins with a vibratory feeder that spreads out a variety of gummies for even loading onto the conveyor elevator. 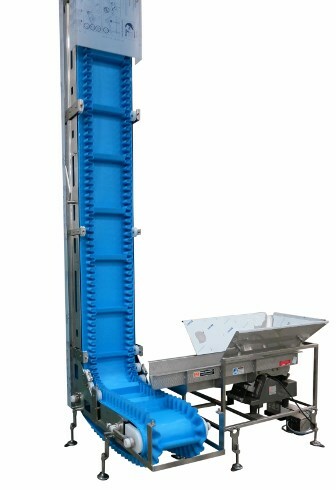 The conveyor then delivers the product to a vertical form fill seal machine. Controls on both the conveyor and vibratory feeder allow for adjustments in product rate or volume at the operator’s fingertips. The custom conveyor was engineered with a special high release surface on top of the belt, the cleats, and even the sidewall cleat that prevents the gummies from sticking. In addition, the top horizontal section features a product thumper that helps the release of the sticky product into the packaging equipment. Lastly, the conveyor features lexan covers for product integrity. All components are designed to be removed without tools to make cleaning and inspection quick and easy. This is an AquaPruf conveyor which is part of Dorner’s Sanitary line of stainless steel conveyors. They are designed for fast and effective sanitation, from wipe down to daily high-pressure wash-down with chlorinated cleaners. Find out more about how our Engineered Solutions can solve your needs.